It seems like everyone has a signature story - you know, the one they tell at parties or family gatherings. It's the story that usually has everyone leaning in, dying to know, "What happened next??" I had never thought about what my signature story might be until yesterday. While brushing my teeth, I pondered the nosebleed I had the day before. I don't have nosebleeds frequently, but it made me realize that I do, in fact, have a signature story. I cannot guarantee that it will be riveting, but if you're looking for a good comedy of errors, read on. When I was in high school, my mom and I were invited to spend the day at Six Flags with family friends and their children. Our friends had enough room in their vehicle for us to ride with them, so they picked us up early in the morning so we could spend the whole day at Six Flags. It was late in the summer, so even in the morning it was hot and humid. We arrived when the park opened and general merriment commenced. Rides were ridden, snacks were consumed. A good time was being had by all until early afternoon. I was sitting on a park bench with our friend and her baby. My mom had taken one of the older children to ride a roller coaster and as they approached, I noticed three things: 1) Mom looked a little green around the gills, 2) I suddenly had a headache and 3) my nose was starting to bleed. Since we were not driving and planned to spend the entire day at Six Flags, neither my mom nor I had brought a purse. We simply brought our wallets, since that was all we thought we would need. Yet there I was, suddenly in need of a tissue. Lucky for me, our friend had young children and a baby, so she quickly handed me a tissue and we thought nothing more about it until I realized that the slow trickle coming from my nose was now a very steady stream. When I realized that my nose was now gushing and that I had gone through all the available tissues, I started to feel a bit sick. At a loss for what to do, our friend shoved a clean diaper into my hands. By now a crowd of gawkers had gathered. There I sat, in all my bloody glory, diaper held unashamedly to my face. I heard a man ask our friend, "Does she do drugs?" He should have known better: jeans shorts, t-shirt tucked in and appropriately bloused over the waistband, large bow in the hair, brown saddle-oxford-style Keds (don't judge me, it was the late 80's) - none of these point to Obvious Teenage Drug User of that era. After several minutes, a clot that was easily 6 inches long came out and the nosebleed started to slow down. Someone in the crowd of gawkers had called security, so around this time a very nice man with a wheelchair appeared and whisked me off to the First Aid building. I'm sure adults and children alike were wondering, "Why is that girl holding a diaper to her face?," as I was wheeled past them, but let's be honest. If you have to ride in a wheelchair to the First Aid building at Six Flags with a diaper clutched against your nose, your inhibitions go right out the window. By the time the nurse looked me over, my nose had stopped bleeding and the whole visit was anticlimactic. She advised me to lay low for the rest of the day and to come back if anything else happened. Funny about that. I was enjoying the afternoon with my now diaperless nose. Mom suggested lemonade, so we found a nice quiet spot to sip our cold drinks. Mom sat down and immediately sprang back up again, which I found a little odd since I thought we were there to rest. Unfortunately for my mother, a bee had already claimed that spot on the bench and made no bones about stinging whatever part of Mom's anatomy that came closest as she sat down. Once again, we found ourselves visiting the nice folks at the First Aid building. By that point, we had spent quite enough time at Six Flags and were ready to go home. By the time our friends dropped us off at home, it was quite late and their children were exhausted. We waved goodbye, thanked them for the ride and opened the door to go inside. Well, we tried. The door was locked. Do you remember me mentioning earlier how neither Mom nor I had brought our purses? Yes. No purses, no keys and these were the days before cell phones. At the time, my dad was still working and usually didn't get home until after midnight, so he wasn't there to let us in. We tried the front door (also locked) and the sliding glass door (yep, locked). There was nothing for us to do but sit on the deck in the dark, wait for Dad to get home and pray that this was NOT a night he had a chance to work overtime. Dad did come home after his shift ended. My nasal passages were fine in the end and Mom's bee sting was a minor (yet painful) annoyance. Don't do drugs, friends. And if you do, I suggest carrying an ample supply of tissues. 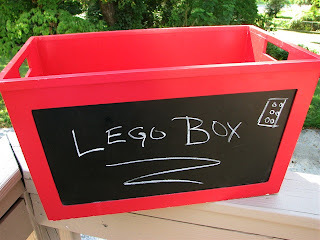 As I mentioned in my previous post, my obsession with Pinterest continues to grow. 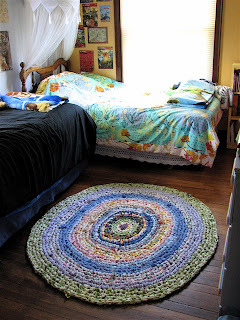 The first project I decided to tackle was a crocheted rag rug. I'm no expert at crochet, but I know the basics and thankfully, that is all you need for this project. I had hoped that I could make a rug entirely out of scrap fabric that I already had on hand, but unfortunately my recent need to purge the house of junk no-longer-needed-treasures left me with little remaining in my fabric stash. There was enough to get a good start, though, and I supplemented the rest for a reasonable price by scouring the clearance fabric bin at Wal-Mart and buying 3 sheets at Goodwill. 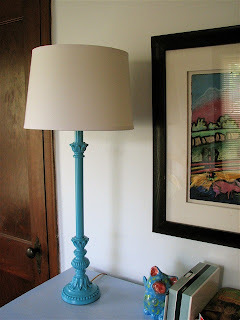 If you are a long-time reader of my blog, you may have gathered that I tend toward the "Go big, or go home" theory with crafting. I don't mean to. I guess it's just my nature. When I was really into scrapbooking, I did it with gusto. When I started knitting, I tackled a Dale of Norway colorwork sweater as my first sweater project. So I guess it is no surprise that when I decided to crochet a rag rug, I would make one that is 4.5 feet wide. I would have loved for it to be even bigger, but as it happened, I had EXACTLY enough fabric for this size. Since I had to buy fabric (cheap though it was) to complete it, I just wasn't willing to buy any more. This is not the color scheme I would have picked if I was actually planning a rug and buying fabric accordingly. However, I meant for it to be a rag rug made from scraps and I love the perfectly imperfect nature of it. Yesterday I posted pictures of the lamp I got at Goodwill. Missing a shade but otherwise in perfect condition, except for a raging case of the blahs. 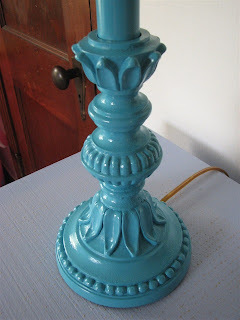 Nothing a can of Valspar "Exotic Sea" couldn't cure. I can honestly say it turned out EXACTLY how I wanted. Now if only I could spray paint the rest of my house. They say the first step is admitting you have a problem, so here goes. I have a problem. I am a Pinterest addict. One look down that rabbit hole and I was done for. So many ideas! So many possibilities! 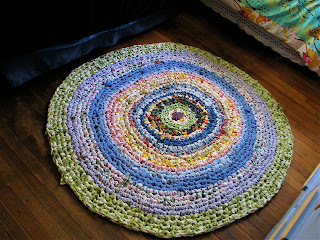 The first project I decided to start after spending some time on Pinterest was a crocheted rag rug. No pics of that today, but I will be blogging about it when I finish (hopefully in the next day or two). 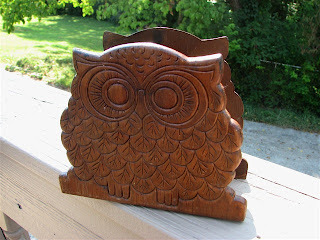 Of course I have been busy pinning countless other project ideas, too, so when I had to go to Goodwill yesterday to look for sheets to use to complete the rag rug, I couldn't help but look around to see if there was anything there that I could use for other projects. I knew I needed books for one project, so I bought 4 of the thickest books they had. It made no difference what the books were; I just need books. You'll see why once I tackle that project. 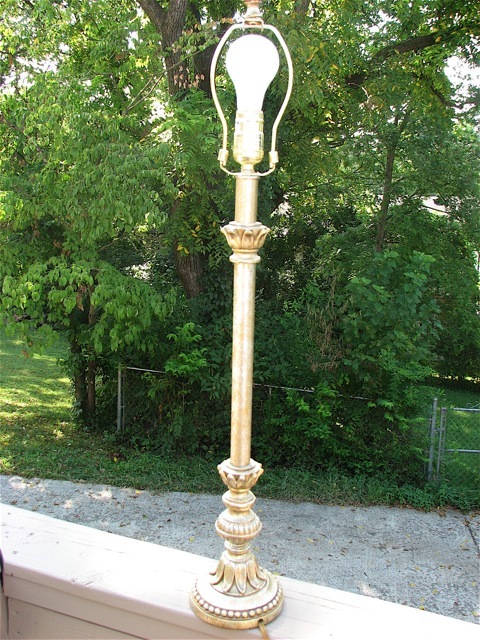 I did find a few other bargains, though, and thought I would share "before" pictures of them since I plan to change them up a little! I got this lamp (minus the light bulb) and plan to get it a shade and a whole new color. 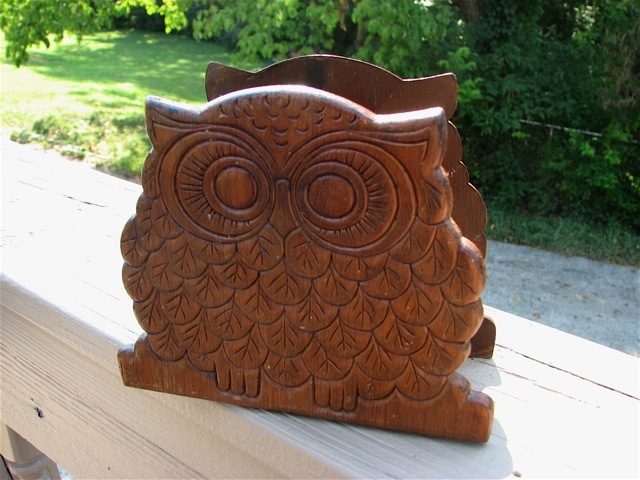 I also found this adorable wooden owl napkin holder, which will also get a new color. My last find is actually just fine as-is. 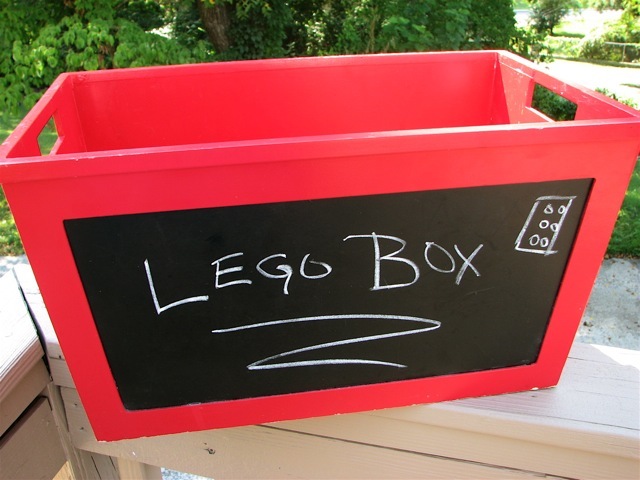 It's a wooden storage basket with a chalkboard side! 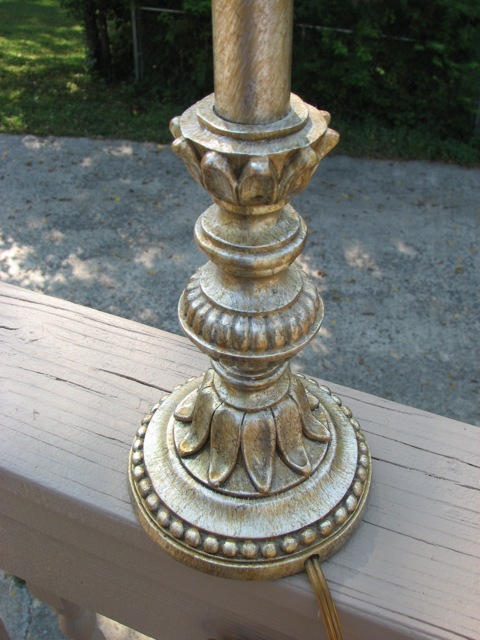 It's a little worn around the edges and needs a good cleaning, but it will be perfect for the play room. Stay tuned for future projects!